BERLIN (CNN) -- Of the millions of the victims of the Nazis, gypsies are perhaps the most forgotten. An estimated half million European gypsies perished in concentration camps at the hands of the Nazis. Germany has paid billions in restitution to Jews. For the most part, however, gypsies have received nothing. Since 1980, German gypsy survivors have been eligible for a restitution payment of roughly $3,000. Only the poor qualified, but many of those were too disorganized, illiterate or outside the system to apply. Gypsy advocates say that all of it adds up to too little, too late. "More than 40 years after the liberation this program started. So many of the gypsies died before and they didn't have any possibility to get restitution," says Thomas Lutz of Aktion Suehnezeichen. 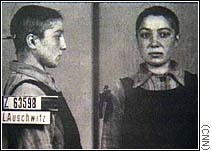 Otto Rosenberg is a survivor. The number Z6084 tattooed on his left arm is now covered by an angel tattoo, in an effort to suppress the memory. "They claimed we move from place to place and were therefore not eligible for compensation. We were in no condition to make demands. I had no job, no choice. I took what they gave me. I signed my rights away to more. You can imagine how much money this saved them," says the holocaust survivor. In the past several years, gypsies have become better organized than at any time in the past thousand years, since they first wandered out of India. Most, however, remain on the fringes. In a summer campsite outside Berlin, Sinti gypsies live in an area funded by $300,000 from the city's senate. Gypsies say they need a special place to congregate. Germany, however, does not want them around. "As soon as Germans know we are gypsies, we have no chance of getting a job. My son and I ran a roofing company, an established business. But if customers find out we're gypsies, they won't even let us in their homes," says gypsy Robert Laubinger. The darkest time in Germany for gypsies may be long gone. 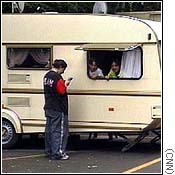 The problem is, gypsies say, they're also for the most part forgotten.